G.V.K. E.M.R.I. (Emergency Management & Research Institute) Val Published Recruitment Advertisement for Medical Officer, Counselling Officer, Pharmacist and E.M.T. Posts. Qualification : Std 12 + ANM / GNM, HAT, B.Sc. 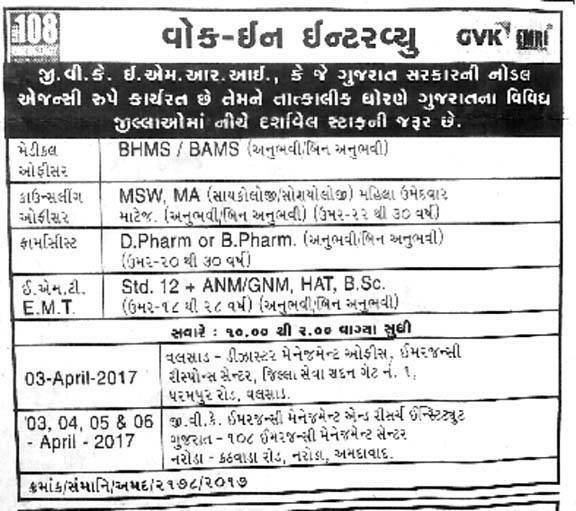 Valsad : Disaster Management Office, Emergency Respose Center, Jilla Seva Sadan, Gate No. 1, Dharampur Road, Valsad. 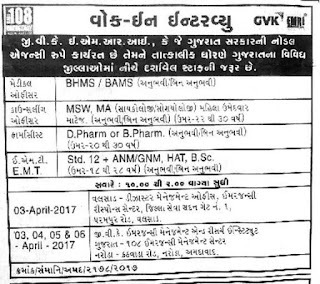 Ahmedabad : G.V.K. Emergency Management & Research Institute Gujarat-108, Emergency Managment Center, Naroda Kathwada Road, Near Dastan Circle, Naroda, Ahmedabad.